Were you, or do you plan to be, successful this hunting season while mountain lion hunting, and you are interested in eating what you kill–but you have no idea how to cook the meat? Well, ehow.com has an entire page dedicated to showing game meat lovers how to cook mountain lion steak in just six steps. 1 – Procure a steak from the body of the skinned mountain lion. Choose any cut of steak such as strip steak, porterhouse steak or fillet strip. 2 – Rinse the meat thoroughly in water and rinse away any hair and excess blood from both inside and outside. Allow the mountain lion meat to sit and drain for five minutes to release more blood and eliminate some of the wild game taste. 3 – Place the mountain lion steak into a cook pot and cover the meat in water. Boil the steak for 30 minutes and drain, removing the brown film from the water. Place the meat back on to boil, and drain again after 30 minutes. 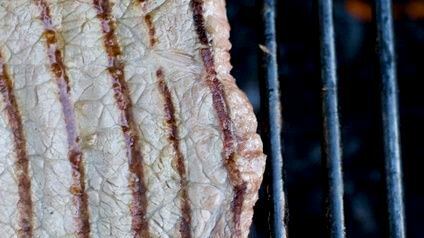 4 – Marinate the partially-cooked mountain lion meat in your choice of marinade. The marinade helps to disguise the wild game taste of the meat. For a simple marinade, rub the meat with garlic powder and salt. 5 – Place the steak in a skillet with cooking oil, shortening or bacon fat. Sear both sides of the mountain lion steak. Cut into the piece to ensure the meat is cooked thoroughly. Continue to cook the meat if any pinkness exists, as mountain lion meat is infamous for problems associated with trichinosis, an infection caused by roundworms. 6 – Consume mountain lion meat after the meat cooks and browns throughout. Serve the meat with earthy, green vegetables like green beans and broccoli.